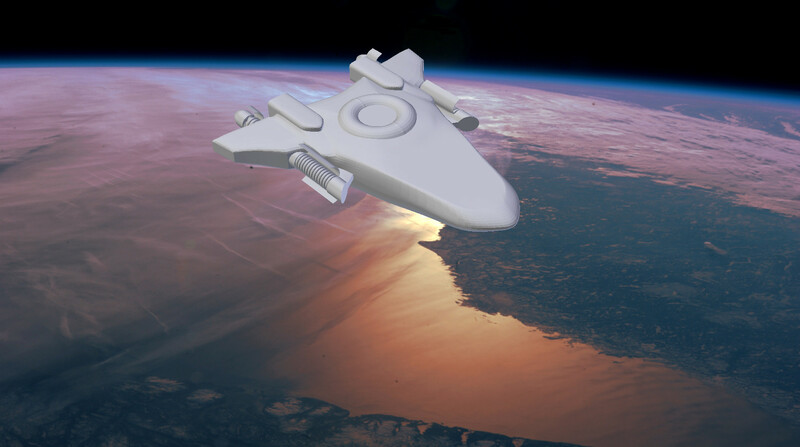 My rendering of the Vasco de Balboa over the Lacertan homeworld. An animal that looked rather like a large, orange beetle leisurely crawled across an outcropping of deep blue and violet vegetation as Dr. Michael Rivers bent down to pick it up. Had any natives been around to observe, they would have said Rivers was the unusual sight in this scene, but he paid the thought no mind. As the creature flailed its eight sturdy legs in the air and snapped its short, wide jaws, he illuminated it with a flashlight to correct for the distorted colors coming from the planet’s two dim, red suns. The creature was really off-white rather than orange, with a pearly sheen. To his surprise, Mike’s scanner told him its exoskeleton was made of calcium phosphate, the main component of human bones and teeth, and indeed, it did look a little like teeth. He pulled a jar from his backpack and placed the animal inside along with a few of the violet leaves it had been eating.He looked up to the blue-green horizon. As always, it was bare save for the sparse plant-life. There was little movement on the plain except for himself and the two other dark-clad scientists collecting samples of the local plant and animal life. Without warning, the head of the team, Bill Hawkins, sprinted headlong past Mike. “We have to get out of here!” he screamed as he rushed by. “What happened?” Mike shouted back. He turned back to see his other colleague, Eliza Yoshida, dash by as well. “Just run!” she told him. Turning back, Mike noticed a thin black line undulating toward the team from the horizon. It was a line of vehicles, and a long one by the look of it. They had been discovered. The local military must have picked up their trail sooner than they had anticipated. He didn’t know what they wanted, but he didn’t want to wait to find out. He immediately turned and ran after his two colleagues. The spaceplane they had flown down to the surface was a couple hundred meters away, but the convoy had come upon them from over the nearby ridge so suddenly that it would be on top of the team before they could take off. The spaceplane was light and fragile, designed for a quick single-stage-to-orbit dash rather than any sort of defense. It took a lot of doing back home just to develop one that would actually land on land without a runway, instead of the usual water. If the natives wanted to ground it, they could do so fast, and easily. “From here?” responded Captain Alonso Garcia. “We might be able to do something with the drilling laser, but it’ll be risky for you. We’ll bring the ship around to get a good angle. Do you want us to prep the second spaceplane for launch?” The second spaceplane—they only had a spare because of its experimental design, and this would mean risking both of them. “I told you we should have called them back earlier,” said Major Rajiv Santhanam. Rajiv was the chief military liaison for the mission and a veteran of exploration missions all the way back to the famed Robert Peary three decades ago. Given the mess of negotiations that had happened at Mu Arae on that first mission, he probably had a point about not exposing themselves too closely to the natives’ attention. But still, his attitude was not helpful, especially right now. “Bill said he wanted to stay,” the captain replied, only half looking at him. “We discussed it and agreed it was still worth the risk to collect some samples,” the captain said. “Including you,” he added. The tension on the ship had risen significantly of late. Partly, it was the extended period of confinement in deep space, which always came with a significant dose of stress. It wasn’t easy being well over a hundred light-years from home, with no contact anyone except by an Achirdian courier drone every few months (although in Rajiv’s day, they hadn’t even had that). Partly, it was the delay last month when a junior crew member had nearly been killed when a plasma conduit ruptured, forcing them to seal off a good part of the ship and shut down the space-warping Alcubierre drive for two weeks to make repairs. They were lucky to get the ship working again. It would take two years to send a rescue vehicle. Now, the lead science team was in trouble with locals, and that would be equally disastrous if anything went wrong. It was no surprised that the mounting incidents were aggravating already frayed nerves for both men. “Then perhaps you should make yourself useful, man the drilling laser and try your hand at shooting them down,” the captain replied without looking at him. The Balboa was a scientific survey ship, custom-built for this mission by the large European-centered power bloc on Earth and designed for speed and making observations and not much else. It had no dedicated weapons. There was as yet no real need for them outside the Solar System, but there was one laser turret normally used for drilling into asteroids. It would not hold up against the few interplanetary patrol ships back home, but it could easily cut through an old-style rocket casing—if Rajiv could manage to hit it. He accepted the charge and sat at the control panel, setting up the laser system. “Do you think they’ll be okay?” Vitoria asked as she watched. Vitoria only nodded. It was generally assumed that any intelligent civilization would realize that alien lifeforms would be more valuable to them alive, if it came to blows. But that was only on average, and even then only a guess. Both of them silently hoped these aliens would not be an outlier. “Mike, hurry up! They’re gaining!” Eliza called out. Mike was still in the rear of the line. Running was not easy on this terrain. Though the vegetation was sparse, the dry, shifting sandy soil slowed them down. There was no cover to speak of; most of the area was a gently rolling plain, which made their getaway that much harder. Mike glanced back briefly to get a look at their pursuers. He still hadn’t quite gotten used to the colors on this planet. To his human eyes, the distorted sunlight made the soil look a uniform orange and the plant life look much darker than it really was, until some of it seemed like pits in the ground—another challenge to running on this terrain. The convoy, however, was all too easy to make out. The military must look the same on every planet, he decided. Artificial structures tended to follow predictable patterns, and in the military even more so. Boxes, wheels, treads, machine guns, armor—a lot of armor—and many angry looking soldiers filled the space behind him. Or at least he presumed they were angry-looking: he couldn’t see their faces and probably would not be able to recognize their facial expressions anyway since, unlike most of the species humans had encountered so far, they weren’t actually humanoid—another sign that they were getting farther than home, he thought to himself in the back of his mind. But mostly, Mike was thinking that he had never liked the military. Bill glanced over his shoulder to get a fix on the convoy, but kept running. He pulled out his pocket computer and tapped a few buttons. The spaceplane’s engines roared to life to warm up, and the door opened automatically. “We’ll need time to warm up the engines,” the first mate shouted, his breath panting. It didn’t help being ten years older than the other two, he mused. Mike was wearing out fast in the heat, though. He wasn’t cut out for this kind of thing any more than Bill was. His peripheral vision was starting to gray out, and he knew from experience that was a bad sign. With an effort, he focused on following Eliza and kept her in view. He saw her glance back and then drop to her knees. Instinctively, Mike dropped to his knees as well, even as she called out “Get down!” Not knowing what was happening, Bill dropped flat on his face. There was a sound of a rocket behind them. The team only saw a blur as a long, shiny object whizzed over their heads and struck the spaceplane. The spaceplane was light and fragile in some ways, but it had to survive launch and atmospheric reentry multiple times with minimal servicing. It ought to be proof against bullets and even small bombs, although whatever that they had been, it didn’t sound like one of those. Mike looked up, and his heart sank. Penetration depth was proportional to the length and density of the projectile, Mike reminded himself. The aliens had been thinking. The heavy, rocket-powered harpoon had punched through the hull of the spaceplane where even a large-caliber bullet would not, grounding it without blowing it to bits so that they could bring it back with them. Technically, the spaceplane could still fly in that condition, but without an intact hull, it could not reach orbit, or even risk flying fast enough to outrun the aircraft that would surely arrive in a matter of minutes. Still, they sprang to their feet and made for the spaceplane again. It was their only cover. An unintelligible voice boomed from a loudspeaker on one of the vehicles in the convoy. Unfortunately, the team’s translation program was incomplete and in any case, no one had time to consult it. When they did not respond, the unmistakable sound of machine gun fire rang out from the lead vehicles, and puffs of dust were kicked where bullets impacts the ground around their feet. Apparently, the aliens were willing to take their chances with injuring or killing one or more of them. In panic, Mike grabbed the laser pistol from his belt and dialed it to maximum power. The power cell would not last long at that setting, but hopefully, it would not need to. As he frantically climbed the ledge into the spaceplane, he swung his arm toward the vehicles and held down the trigger, firing half-blind at about eye level. A thin, bright ray of red light lanced out from barrel to target, blinking on and off several times per second. It was shimmering, dazzling, as a fraction of its power reflected off the dust and sand in the air. Wherever the beam struck its target, it burned, searing armor and cutting through anything that was not metal, including flesh and bone. The machine gun fire intensified. Mike managed to pull himself inside the spaceplane without getting hit. Bill, however, wasn’t so lucky. As Eliza helped him up and behind the cover of the hull, he was hit twice in the legs. “Dr. Yoshida, where are you?” Garcia asked. The captain heard a hail of bullets and the loud, grinding sound of something punching through the hull. “Not long!” Mike called. Garcia thought he heard the characteristic buzz of a laser pistol in the background. Whether the aliens were trying to kill them or just smoke them out, he could not guess. “Uh…at least a dozen trucks. Probably more…can you hit them?” Mike said between shots. “What do you think I’m trying to do?” Mike shouted. There was a crack, and the radio was filled with static and confused shouting. “Dr. Yoshida…! Dr. Rivers…!” Garcia yelled. There was no response. “What if we take the ship down?” Vitoria suggested desperately. “The aliens have reinforcements on the move. We can’t hope to defend them from here,” Rajiv insisted. Everyone on the bridge racked their brains and checked the database for something that would help. “Can the ship handle a dive instead of a drop?” one of the officers suggested. “No, we could never land it that way.” the captain said. Captain Garcia was trying to resist the creeping realization that Rajiv was right—there was very little they could do at this point. Still, now that things had come to shooting on the ground, he refused to give up. “What about it?” Rajiv said. “It can lift the spaceplane, can’t it?” The space-warping power of the Alcubierre drive could just as easily be targeted into a narrow beam of gravitational energy, though it was a new innovation that had never remotely been tried like that before. “That will never work,” Rajiv dismissed her. “No. It’s not possible. I can think of at least half a dozen ways that would kill the team,” Rajiv replied. The Balboa’s Alcubierre drive propelled the ship by compressing space at one end of the hull and expanding it at the other end without having to worry about moment, at least in the usual sense. Its best-publicized use was to go faster than the speed of light, but they had to use it just to hover here. The ship didn’t have the fuel to do a maneuver like that with rockets. “I said enough!” Garcia cut him off. In the momentary silence, Bill’s voice finally came back clearly, though painfully, over the radio. “Bill! What’s your status?” the captain asked quickly. Mike was pressed against the now-battered wall of the spaceplane. The hull had stopped ordinary rounds, but they’d been lucky not to be impaled on the harpoons, and the aliens had also targeted several explosive rounds on certain safe areas, like the door, blasting holes in the side. His heart was pounding, and he was out of breath. Still, he reached around the jagged edge of what was left of the door and pulled the trigger on the laser pistol. Instead of a soft buzz and a brilliant red beam stabbing out, there was only a click. After a few moments, the aliens seemed to realize that Mike’s frantic, semi-regular shooting had stopped. There was some confused shouting, and their guns fell silent as well. At least half the initial convoy was undamaged, and reinforcements must be on the way. They kept their distance, likely suspecting that the humans were still alive and unsure what they would do. The seemed to want the spaceplane with as little damage as possible, but that concern wouldn’t keep them out for long. More alien speech came from the loudspeaker. The team still could not understand it, but they could tell the words had changed slightly. “Any luck on that translation program?” Eliza asked in annoyance. She was on the floor, still trying to stop Bill’s bleeding. “Um, I can try it,” answered Mike. He felt around his pockets, and found his pocket computer again. He also noticed the radio, which had been lying in the corner for some time, though he didn’t quite remember how it had gotten there. He tossed it to Eliza, but Bill insisted on taking it. “Well that’s just great,” said Eliza bitterly. “Bill! What’s your status?” the captain asked from the radio, responding to his first mate’s call. That was a little comfort in itself. Evidently, the aliens either could not jam the signal or were not trying. “Ah…not good. The aliens…want us to come out,” Bill said, gasping for breath. “I’m not sure Dr. Hawkins can walk, though,” Eliza cut in. “What are the aliens doing?” Rajiv demanded. “You should probably do what they say,” Rajiv instructed. “Bill, we have a possible backup plan, but it’s risky,” the Captain said. “I would say borderline-suicidal,” Rajiv said. None of their options were good. For two days, they had hidden in the remote corners of this alien world, treading lightly and observing only from a long distance. Even when they saw twentieth century-level technology on the planet, they hardly considered the possibility of getting caught. It wasn’t like the aliens had the total surveillance coverage that developed early in the twenty-first century on Earth. Now, it was clearly a mistake not to plan for it better. “I agree with the Major,” Eliza said. “Surrender now, and contact them from the Balboa. We can’t fight our way out down here, and it’s less of a long shot than something untested. “They might be mad at us for shooting at them,” Mike said. Of course, he was the one who did most of the shooting. Mike considered this and their desperate situation and was forced to agree. His position, or his colleagues’, wasn’t about to get much better. “Alright, I don’t see what else we can do,” he said. Eliza lifted Bill up and supported him with one arm across her shoulder. Mike set the translation program to voice-command-activated audio mode and clipped his pocket computer to his shirt—to the sleeve and not the collar, in case the aliens were trigger-happy. Then, he reached for the door handle of the spaceplane, stood behind the wall, and forced it open. There was some shouting in the aliens’ camp that the translation program didn’t pick up because there were too many voices at once, but when no one was standing in the doorway, they went quiet again. Mike stuck a hand into the open doorway and, when it didn’t get shot off, stepped fully into the opening with hands raised. Eliza and Bill shuffled into view behind him. Mike stepped down to the dirt as slowly as he could, and the others limped down after him, hopefully looking non-threatening. Ten or twelve of something like trucks had formed a perimeter around the spaceplane. As the three humans stepped away from the door, dozens of hard-faced aliens jumped from the trucks and lined the perimeter. All were wearing combat helmets, and most had things that looked like automatic weapons trained on them. Michael Rivers and his colleagues had seen a number of alien species in their travels, some nearly human in appearance, thanks to some prehistoric civilization’s genetic experiments, and others not so similar, all the way to the point of having a different biochemistry. These particular aliens, as it happened, could be described as semi-humanoid. They had the basic human body plan: head and sensory organs on top, upright posture, and two arms and two legs, but they were too different for anyone to convince themselves that they were some exotic breed of humans. They looked more like kangaroos than humans, in fact, though even that was a loose description, given their long, spindly arms with an extra elbow joint and large heads with what were probably carnivorous jaws filled with sharp teeth. They did have a hopping sort of gait, but it was less of a long bound, and their twinned tails were unlike anything on Earth. From what they could see, the aliens looked to have yellow-to-rust-colored fur, seemingly evolved to blend in with the sandy soil. The humans didn’t have to be able to read the aliens’ facial expressions to guess that they were angry, although the bared teeth were a good hint. They had just been in a firefight, after all. Mike noted that they wore uniforms that looked like typical military garb: yellow-orange fatigues with flecks of blue mixed in, also designed to blend in with the local terrain. “They’ve gotten out of the trucks,” Bill said to the radio he still held the radio in his hand. He was the ship’s only link to the situation down here. They didn’t have any robots in a good position to get video. One of the aliens who looked like some sort of commander called out an order, apparently to the humans. “Step away from the…aircraft,” Mike’s computer played back, the pause coming as an indication that the program wasn’t sure what word to use. That wasn’t encouraging. But the perimeter was wide enough to give them quite a bit of room to move away from the spaceplane. They took a few steps forward, then the commander made a hand gesture, and several soldiers formed a line between them and the spaceplane. The three humans glanced at each other from the corners of their eyes. “Say something,” Eliza whispered. The computer accepted the voice command and played back a disjointed, halting version of the aliens’ speech consisting of single-word recordings gleaned from media broadcasts. Immediately, there was shouting from the soldiers in the circle. They tensed their hands on their guns. “What happened?” Eliza called over the din. “How should I know? Maybe it didn’t translate ‘scientists’ right,” Mike responded fearfully. “What?” Mike gasped. “Translate! We’re not vivisectionists! Our translator made a mistake!” He cursed whatever linguistic or historical quirk had made “scientist” come out as almost the same word as “vivisectionist”, presumably both variations on “experimenter”. The aliens didn’t seem to be listening. “Take them in!” their commander said. “Alonso, I think we want that backup plan now!” Bill said. The aliens were advancing. “Vitoria, do it!” the captain’s voice came through. It took about half a second for this to register, and then all three scientists dropped to the ground. This probably saved both the three of them and several of the aliens, who had nearly reached them, but jumped back at the sight, fearing a possible explosion. A few shots were fired, but they went wide. There was no explosion, though. Instead, there was a strange rumble and a sudden rush of wind, and almost faster than the eye could follow, Bill, Mike, and Eliza shot rapidly upward, along with the entire column of air around them and a large chunk of the soil underneath them, which was quickly stripped all the way down to bedrock. It was only because they had jumped back at the last moment that several of the alien soldiers avoided being caught up in the gravity beam from the Balboa, but even the most brazen of them turned and ran when the partial vacuum caused by ripping up the air and soil caused a powerful inflowing vortex of air, and they would count it a miracle that they didn’t lose any of their number. The raft of soil flew upward and nearly out of sight incredibly fast, being pulled with ten gees of force towards the Balboa, a hundred kilometers above. Inside the beam, the team was effectively in freefall, all “falling” up together with the air and soil around them. They lay on the disintegrating mass, trying the best they could to hold on in the weightless environment. It was a terrifying situation. The air pressure was dropping rapidly, and the wind was howling louder and louder at the edges of the beam, passing the sound barrier in a matter of seconds and tearing off chunks of soil from their “raft”. As they passed through the upper atmosphere, the rushing wind began to glow red hot from the friction, like a meteor moving the wrong direction. It must have been a dazzling sight on the ground, bright enough to be seen across half the continent, even in daylight. Still the gravity beam held the column together, and they continued to race upward. Forty seconds after they left the surface, they could clearly see the Vasco de Balboa rushing toward them when they looked up, now just twenty kilometers away. It was a windswept triangular shape, showing a clear resemblance to their spaceplane, except for the long space-warping coils stretched along its length and the huge fusion reactor embedded in its center. It had been facing backwards to bend space against its orbital motion and hold its position, but now, it tilted up to match their speed. A shimmering of distorted space was visible all around it. Forty-eight seconds after “liftoff”, the team passed through the field of distorted space. The entire column of material—sand, dirt, rock, and air—was torn apart by tidal forces of seven gees per meter of length. Fortunately, Mike, Bill, and Eliza were lying flat, present very little vertical depth to the field. The tearing force was merely uncomfortable, and brief. Being plunged into hard vacuum was by far the worse part of it. The air was ripped from their lungs, and the roaring win changed to an ominous silence in an instant. After a harrowing five or ten seconds in vacuum, they came alongside the Balboa’s open cargo bay, moving in perfect sync with it. Another, smaller gravity beam pulled them inside, and the operator closed the door. They felt the universe spin, both from lack of oxygen and from the artificial gravity reactivating (which, naturally, worked on the same principle). They dropped to the deck, the cargo bay repressurized, and they were in calm air again. The whole “flight” from the surface had barely taken over a minute. The ship’s doctor rushed in along with everyone on the crew who had medical training. They took one look at Bill and loaded him onto a stretcher. One of the others checked Mike and Eliza for injuries. “Ow,” Mike groaned, “I think I landed on something.” He reached behind his back and pulled out the same jar containing the beetle-like creature he had collected. The jar was slightly cracked, but still in one piece, and the animal was still munching happily on its violet leaves, seemingly indifferent to the insanity around it. With an exhausted laugh, Mike lay back on the deck. He reflected on the last—how long had it been? A mere half an hour, maybe less. He laughed louder, almost hysterically, at the thought, but he soon ran out of breath again. Moments later, Captain Garcia and Vitoria entered the cargo bay to welcome the team back. Before they could speak, however, Mike pulled himself up and approached them angrily. The effect was lessened somewhat by the fact that he couldn’t walk straight yet. “Well, a back of the envelope estimate said it would be safe,” she defended herself. “Chuck Bradford didn’t build a working Alcubierre drive on the back of an envelope,” Mike replied. “And by ‘sort this out’, he meant he wants to talk to the aliens?” Bill asked incredulously. He lay on a bed in the small medical bay hooked up to an IV and with bandages wrapped around his legs. He also had a few scraped from the harrowing flight back to the ship, but he was generally in good spirits. “So where are we sitting now?” Bill asked. “No, I’m pretty sure I remember us crossing into Lacerta a couple of months ago,” Bill answered. “Lacerta means ‘lizard’,” Eliza observed. “Mike, if you think you can sell Alonso on it, go ahead,” Bill suggested. All eyes turned to Captain Garcia, who must have been listening in for some time. “We appreciate it, Captain,” Eliza said.